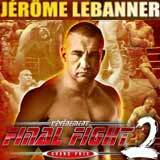 Review by AllTheBestFights.com: 2015-04-25, pretty good fight between Jerome Le Banner and Claudiu Istrate: it gets three stars. The 42-year-old K-1 legend Jerome Le Banner (23 years older than Istrate) entered this fight with a professional kickboxing record of 79-22-2 (64 KOs=81%) and he is ranked as the No.10 heavyweight in the world. He suffered his last defeat in 2013 when he faced Sergei Kharitonov (=Le Banner vs Kharitonov), since then he has won twice beating Lucian Danilencu (=Le Banner vs Danilencu) and Colin George (=Le Banner vs George). His opponent, Claudiu Istrate (who replaces Lukasz Krupadziorow), has an official record of 21-9-4 (5 knockouts) and he comes off the loss against Mikhail Tyuterev at the Tatneft Cup 2015 tournament. Le Banner vs Istrate, main event of Final Fight 2, is valid for the ISKA K-1 rules World Super Heavyweight title. Watch the video and rate this fight!